Located on Geary Blvd. 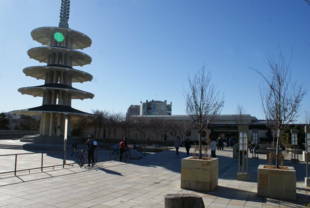 next to the Nihonmachi Mall Shopping Center, Japantown Peace Plaza is a great place to rest your feet if you've been shopping. There are benches to sit down on and some greenery to admire; however, the main attraction is the Peace Pagoda that has been there since 1968. 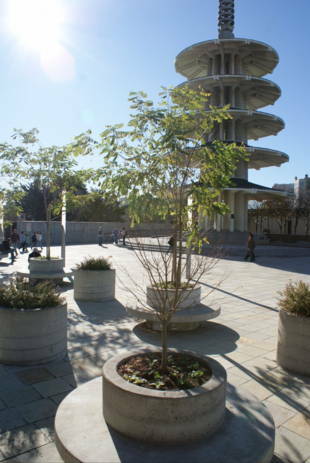 Japantown Peace Plaza is owned by the San Francisco Recreation and Park Department. 38-Geary: off-board at either Geary/Webster or Geary/Laguna. The Peace Plaza is on the north side of Geary between Webster and Laguna. If you take the 38L (limited) bus, you can only get off at Laguna. 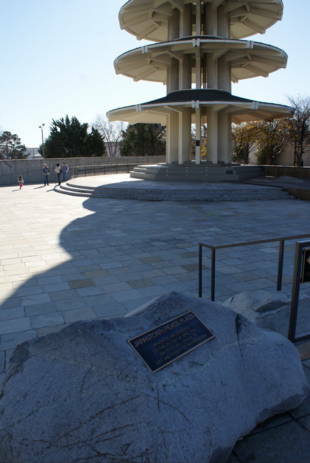 Designed by Japanese architect Yoshiro Taniguchi and presented to San Francisco by the people of Osaka, Japan, the Peace Pagoda is a five-tiered concrete stupa that has been part of the Nihonmachi (also known as Japantown) Peace Plaza since it opened 1968. The area known as Japantown today was formed after the 1906 San Francisco Earthquake and fire. It occupies an area of the Filmore district that is roughly within the confines of California Street to the north, O'Farrell Street to the south, Fillmore to the west and Laguna to the east. Most Japanese immigrants to the United States entered the country through San Francisco, and many settled either south of Market Street or in the Chinatown area. With the 1906 earthquake in SF and the rapid expansion of Los Angeles, many Japanese immigrants left SF and moved to what is now known as Little Tokyo in Los Angeles, which remains the most populous Japanese settlement in California today. Many former residents of San Francisco chose not to return after the forced internment of Japanese Americans during WWII (1942-45.) (Some second or third generation Japanese Americans were interred as well.) - About one-third of the internees followed the encouragement of the War Relocation Authority and resettled in the East and Midwest. Japantown was also negatively impacted by redevelopment in the 1950's with the widening of Geary Boulevard and the destruction of dozens of Victorians to make room for both the boulevard and the Japan Center Mall. The Webster Bridge's design was inspired by traditional Japanese pedestrian walkways. In addition to providing a safe passage over the traffic on Geary Boulevard, the arched bridge has views of Japan Center and San Francisco's Western Addition. 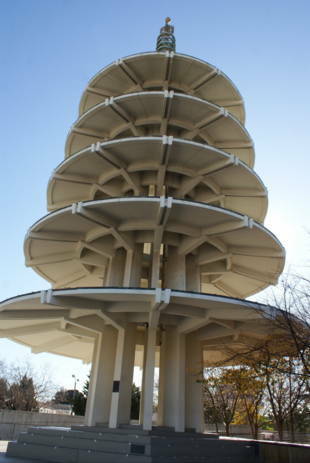 The Japan Center - with its Peace Plaza and five-story Pagoda is the dominant architectural structure in Japantown. Fairly non-descript on the outside but filled with delightful restaurants and shops, stairways and open courtyards, the Japan Center Mall is a concentrated expression of Japanese culture in the middle of San Francisco. The AMC Kabuki 8 Theater - home to the annual San Francisco Asian American Film Festival - is at the western most end of the Japan Center mall and the Kabuki Springs and Spa is at the other end, just a block from the Filmore Auditorium on the other side of Geary Boulevard. The Miyako hotel at Post and Laguna has a picturesque Japanese garden. There are also two public garages with discounted, validated parking. 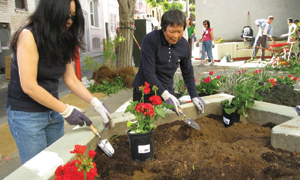 Ruth Asawa designed the twin origami-style fountain in the middle of the one block open air mall that visually extends Peace Plaza north toward Pacific Heights.